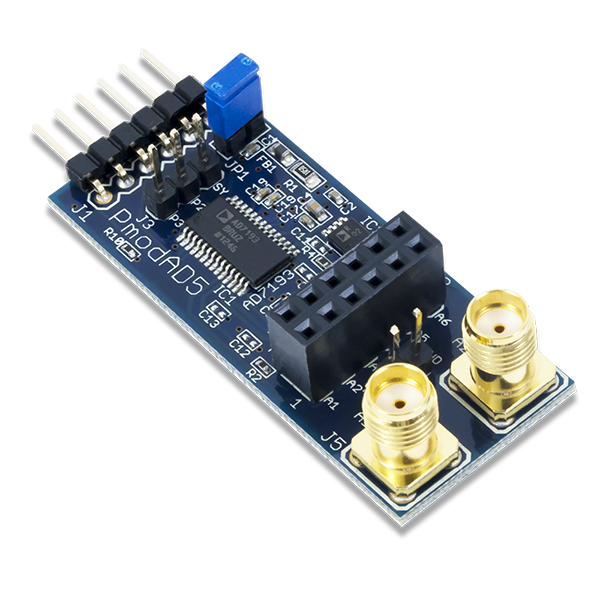 The Digilent PmodAD5 (Revision A) is an analog-to-digital converter (ADC) that utilizes a fourth order Σ-Δ modulator, a programmable gain array, and on-chip digital filtering including a variety of sinc filters and zero latency features, all powered by the Analog Devices AD7193. 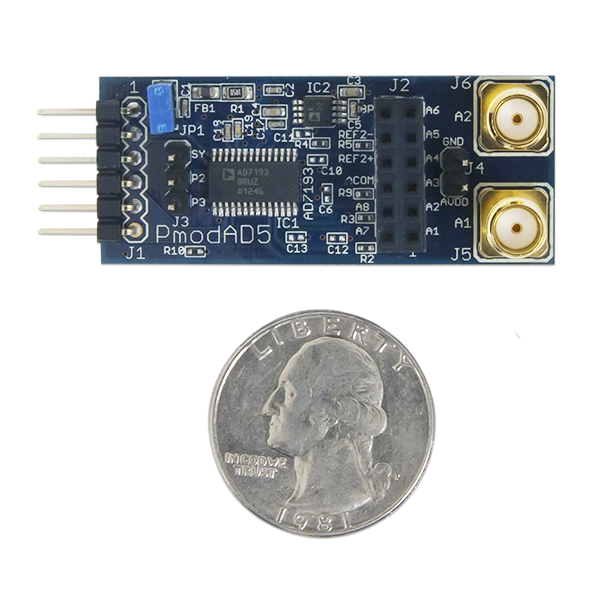 The PmodAD5 utilizes Analog Devices AD7193 to provide 4 differential or 8 pseudo differential analog inputs. With 24-bit resolution and rms noise as low as 11 nV, highly accurate voltage measurements can be taken. The PmodAD5 communicates with the host board via the SPI protocol. By driving the Chip Select line low, users can transfer information to and from the device with the most significant bit (MSB) first. 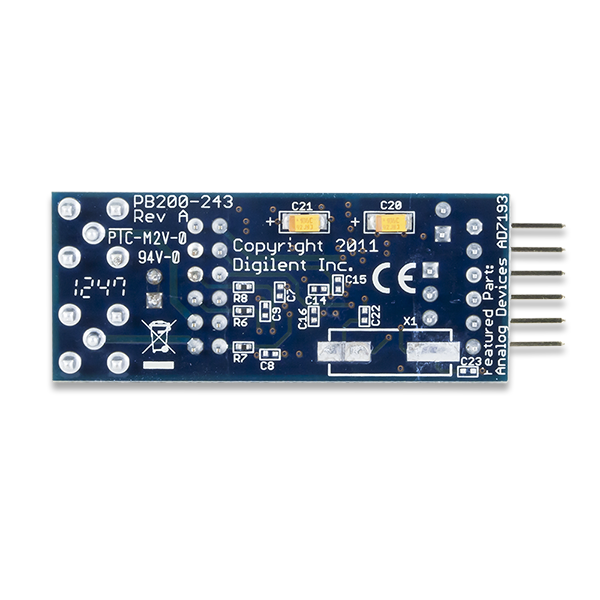 Some users may wish to have a wider voltage range that they are able to analyze than 2.5V ±19.53 mV. This can be adjusted by changing specific values within the Configuration register; namely, the Reference Select bit (D20) and the three gain bits (D2-D0). Any incoming input voltage to be measured must be within ±(AVDD-1.25V)/gain. As AVDD must be within 3V and 5.25V, if a 5V power supply is used, the largest possible range of incoming input voltage is -3.75V to 3.75V. By default, the jumper on JP1 is loaded such that the AVDD voltage matches the DVDD voltage. If users want to apply a higher AVDD voltage to header J4 so that they are able to utilize larger reference voltages, the jumper block from JP1 must be removed so that the two voltage sources are disconnected. Any external power applied to the PmodAD5 must be within 3V and 5.25V; however, it is recommended that Pmod is operated at 3.3V. The pins on the pin header are spaced 100 mil apart. The PCB is 1.9 inches long on the sides parallel to the pins on the pin header and 0.8 inches long on the sides perpendicular to the pin header. The schematics of the PmodAD5 are available here. Additional information about the ADC including communication modes and specific timings of the chip can be found by checking out its datasheet here. More specific information about how to use the PmodAD5 including how to setup the simultaneous 50 Hz/60 Hz rejection can be found by checking out our user guide. Example code demonstrating how to get information from the PmodAD5 can be found here. 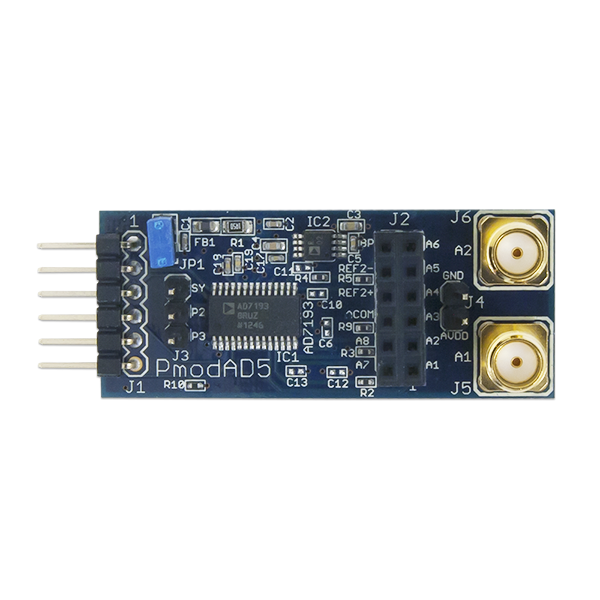 If you have any questions or comments about the PmodAD5, feel free to post them under the appropriate section (“Add-on Boards”) of the Digilent Forum.